A horror flick about a valet who uses his client's cars to break into their homes, and then finds a woman being held captive in one of them. It stars Robert Sheehan, David Tennant, Kerry Condon, Carlito Olivero, Lisa Brenner and Jacqueline Byers. It was directed by Dean Devlin, and it was written by Brandon Boyce. The movie was filmed all in Portland, OR, and it's received mostly positive reviews from critics. I enjoyed the first half of the film, but became very bored by the second. Sean Falco (Sheehan) is a poor restaurant valet, who breaks into people's homes using the vehicles he's entrusted by them. One night he finds a woman, named Katie (Condon), chained up in one of the houses he breaks into. Sean doesn't call the police, out of fear of being busted for his crimes, and later he deeply regrets it. 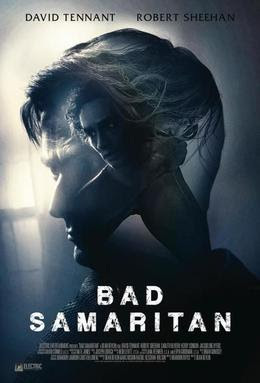 He then risks his own life, multiple times, desperately trying to make up for his error in judgment and rescue Katie from her captor, Cale Erendreich (Tennant). Cale makes Sean's life very miserable in the process. The movie has a great setup (it's really creepy, disturbing, interesting and involving), and then it goes absolutely nowhere equally as effective with it. I was so bored and annoyed by the third act of the film, that I couldn't wait for it to be over. I did really like the first half of the movie though. I like Dean Devlin as a filmmaker (in general), I like Sheehan as an actor, and I really like the Portland setting of the film as well. I can only recommend half the movie sadly still though.